It is the dead of winter and grey, bleak and cold, so you might feel tempted to curl up on the couch with your favourite libation and a stack of nursery catalogues. Instead, why not bundle up and take a walk around your garden with notebook and camera in hand? Without leaves or flowers to distract you it’sthe ideal time to cast a critical eye on your garden. First, take photos of the whole garden—beds, paths, containers, entrance—both looking towards the back and towards the house. We tend to get into the habit of viewing our gardens from the same vantage point, and a fresh point of view can open up possibilities for a new sitting area, placement of furniture or sculpture, or new plantings. The photos will be the start of a record of the evolution of your garden and a reminder of which plants to buy in the spring. Look for bare spots and plants that are too close together or have outgrown their space. If the ground is soft enough, use coloured golf tees or chop sticks to mark the plants that need to be moved or divided next spring. Use one colour (or combination of colours) for each one to be transplanted, another for each division and a matching colour showing where each plant will be moved. If the ground is hard frozen, make notes or mark your photos. Is the garden looking flat, dull or boring? We tend to forget that winter can be five months long here. Canadian gardens need to be designed for FOUR seasons–winter is simply too long to ignore. On your garden walk, note the spots that would benefit from winter foliage, interesting bark, colourful twigs, and textural grasses. In my opinion, the best remedy for a dull winter garden is conifers. There are so many shapes, sizes, textures and colours from which to choose. They will provide structure and contrast year-round. Particularly interesting is Chamaecyparis spp.—also known as Cypress and False Cypress. These range from 20-metre-tall trees to 80-centimetre-dwarf shrubs, in upright or weeping forms. Their soft, fern-like, lacy foliage can be dark green, blue-green, golden-tipped, silver-blue, golden yellow, or bronze. You can see many dwarf specimens in the TBG President’s Choice Show Garden. Pines, cedars and yews also provide texture, scent and shelter for birds all year, and can be planted as privacy screens. Broad-leaved evergreens, such as Euonymus and boxwood–whether dark green or variegated–can be clipped and shaped to add form and structure to garden beds. Everyone is familiar with the red twigs of Red Osier Dogwood (Cornus sericea) and the bright yellow branches of Yellowtwig Dogwood (Cornus sericea ‘Flaviramea’), but these shrubs tend to get very large and rangy. Keep them shapely by cutting out older branches from the base of the plant. 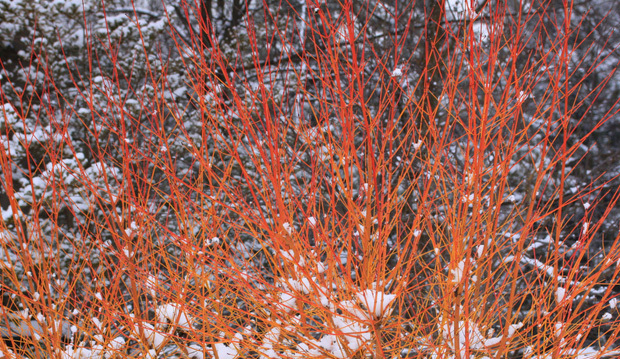 My favourite of the colourful dogwood shrubs is ‘Winter Beauty’ (Cornus sanguinea ‘Winter Beauty’) with its yellow, coral and orange twigs in winter, and yellow fall foliage. It does not get as big as the others but it does sucker slowly so give it room to spread. Like all colourful dogwoods, the branch colour is best on new growth so you should prune out one third of the oldest stems each year from the base of the shrub. Cutting the branches in late fall will give you showy twigs to use in winter arrangements. Large shrubs and small trees with interesting branching patterns and bark add a great deal to the winter garden. Two small maples that are beautiful all year really stand out in the fall and winter, and both grow six to seven metres tall. Paperbark maple (Acer griseum) has dark red fall foliage and distinctive, paper-like, exfoliating, cinnamon-coloured bark. Coralbark Japanese maple (Acer palmatum ‘Sango Kaku’) has gold fall foliage and coral-coloured bark on young branches that become brighter during the winter. Ornamental grasses are the perfect way to add colour, texture and movement to the garden. When backlit by the sun, the blue (Blue Oat Grass) and gold (Hakone Grass, Miscanthus spp.) leaves and white plumes (Pennisetum spp.) make the garden glow in winter. When your assessment of the garden is done, head back into the warmth of your home. With your photos, lists and fresh ideas, you are ready to dive into those nursery catalogues.